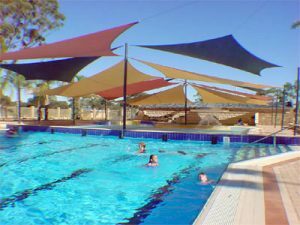 Melbourne Shade Sails provide homes and businesses throughout our great city with a marvellous range of shade systems. In addition to offering protection from the sun, our semi-waterproof shade sails provide shelter from showers. Whether you’re looking to create a delightful outdoor entertainment system at your home, a sun-safe and protected play area at a school, or a wonderful place to relax for your customers, we can provide a shade cloth to suit. We can custom-make a shade to suit your needs, with a range of options in the size, colour, and shape. One of our expert consultants will take the time to discuss your needs with you, including whether you need a waterproof shade sail, and create a canopy to match. We offer professional, efficient installations throughout Melbourne. We ensure that every aspect of the job is completed to the highest degree of quality, to provide you with a product that will stand the test of time. For more handy home and business owners, we provide DIY Kits with quality parts and easy-to-follow instructions. We make it easy to do-it-yourself. Call us now to set up a FREE onsite measure and quote for semi-waterproof shade sails on 1300 99 32 37. © 2019 Melbourne Shade Sails. All rights reserved.